FAMILIES are preparing to remember their lost loved ones at a special memorial service at Lancing College today (November 22). The service will see some 600 people file into the iconic chapel at Lancing College for a service led by the Bishop of Chichester Martin Warner. The congregation will be made up of families and friends of the 11 men who died when a Hawker Hunter jet crashed onto the A27 while taking part in an air display as part of the Shoreham Airshow. In addition, members of the emergency services who were at the scene will also be in attendance. 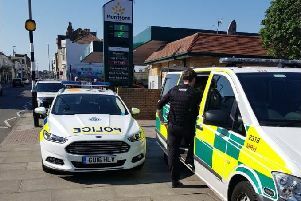 “It’s been very much designed around the families and first responders who have been very involved in the whole process down to choosing readings and the hymns so it’s very much their time to help with the healing and grieving process,” West Sussex County Council leader Louise Goldsmith told this newspaper in the run-up to the service. The service is being broadcast live on BBC Radio Sussex. East Worthing and Shoreham MP Tim Loughton said he hoped people across Sussex could be part of today’s service through listening to the radio. “We’ve encouraged people to group together,” he said. For those unable to listen to the radio, Sussex Newspapers will provide a Shoreham Remembrance live blog so people can be part of the service.